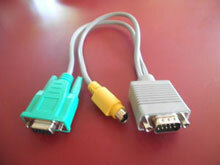 Topaz - PS/2 VGA Connector Serial Cable. Non-Cancelable/Non-Returnable. The Topaz A-CSA4-2 is also known as Topaz Systems	A-CSA4-2	or ACSA42	.